The Best CRM Blog: CRM Tips: How to Create Acquisition Strategies through Customer Lifecycle Value? 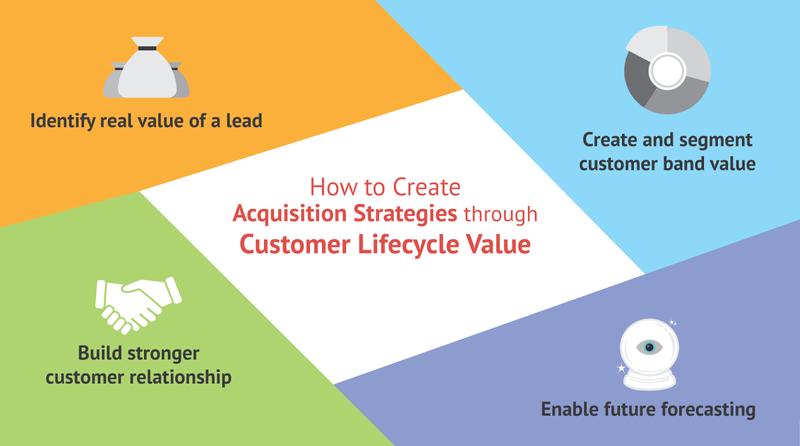 CRM Tips: How to Create Acquisition Strategies through Customer Lifecycle Value? It is a known fact that cost of retaining, growing existing customers is comparatively very less than acquiring new ones. However, many companies ignore this simple and fundamental rule of incremental selling strategy. We will now see how you can avoid that with the help of CLV – Customer Lifecycle Value, the often ignored vital metric that aid you to create a winning customer acquisition strategy. Avoid overspending or underspending in CPL (Cost per Lead). Correct deviations on marketing acquisition costs. Learn the cost of growing AUM (Asset under Management). Use sensitivity analysis in CLV to find the exact financial impact if your organization manages to reduce customer churn. With the help of CLV, which is integrated in a CRM software, you can segment customers based on their derivable potential value. You can find that out by differentiating between high and low CLV segments and deriving untapped cross selling/ up selling revenue opportunity. You can then create personalized marketing communication campaigns that are relevant and timely. Customer segmentation can make a huge impact on your company’s revenues and margins. Often companies delve deeper into customer profits, which is a historical metric. CLV is a form of predictive analysis that helps you to predict customer trends, patterns and preferences. The information derived will help you create a proactive strategy that can create deeper customer relationships. You can confidently face your future business challenges with the help of CLV. Most companies treat customer relationship as a byproduct of marketing. However, CLV helps you to treat customer relationship as an asset that is to be nurtured and grown. It will refocus your objectives from short term profits to long term value derived from robust customer relationships. Customer lifecycle value derived from a CRM software can be a catalyst to existing customer focused metrics like customer loyalty and satisfaction. Thus, you can create acquisition strategies that is both forward looking and customer centered.